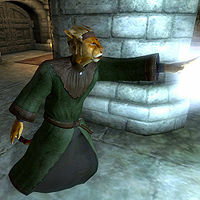 M'raaj-Dar is a Khajiit mage and an Assassin of the Dark Brotherhood living in the Cheydinhal Sanctuary. He is killed during The Purification. Before you are introduced to him after having spoken with Ocheeva, he will always be found on the way towards Vicente Valtieri's Quarters, only taking a break at 4am to eat for five hours. After he has given you his "warm" welcome to the guild, he will resume his usual schedule. He sleeps in the Living Quarters from midday to 5pm. Once he has woken up he will head to the Training Room, where he will spend the next hours training his magic skills, taking a one-hour break at 7pm, 10pm, and 1am, when he will instead read a copy of The Five Tenets while waiting for his magicka to restore. After a long day of training he will leave the Training Room at 4am and will head back to the Quarters to have his meal of the day until 9am; at that time he will leave the Quarters again to wander around the Sanctuary Hall until his bedtime. M'raaj-Dar will offer services at any time of the day, even while he is sleeping or eating. His garment consists of a green robe and a pair of pigskin shoes. He also carries two weak potions of sorcery, his copy of The Five Tenets, the key that grants access to the abandoned house, the one that unlocks his chest, and a leveled amount of gold. In combat, he relies on the same spells that he sells you. In addition, along with all the other family members but Vicente, he possesses an ability that gives him 20% Resist Magic and Resist Normal Weapons. His only private possession in the Sanctuary is the chest at the foot of his bed, which contains three scrolls: a Greater Fortify Health, a Shadow Shape one, and an Open Easy Lock one. He will make clear what he really thinks about you the very first time you meet him: "If it isn't the newest member of the family. Let's get one thing straight -- the Tenets prevent me from killing you. But I don't have to like you. I'll sell you equipment, but only because Ocheeva is making me. This family doesn't need any... outsiders." After that he will say "You again? I thought I'd made it clear I'm not looking for a friend. If you're here to buy or sell something, get on with it already!" If you ask him about rumors, he may rudely respond by saying: "I have it on good authority that the newest addition to the Brotherhood is an annoying whelp unworthy of licking my boots. How's that for gossip? ", or may give you some information about recent events in the Black Hand: "The Black Hand is trying to keep it very hush hush, but one of their own has been assassinated! It would seem the Brotherhood has been infiltrated." Once you have progressed through the ranks of the guild and receive The Purification quest, he will become more friendly towards you: "Ah, there you are! Look... I've been thinking, and... Well... I guess I just want to say I'm sorry for the way I've treated you in the past. I mean, look at you! The things you've accomplished! You've obviously proven yourself a valuable member of this Sanctuary. So let's start over, shall we? I know from now on, you and I are going to be great friends! Now, is there something you'd like to buy or sell?" From then on, once you greet him, he will say, "Hey, there's my new pal! So what can I do for you? Need some items? Or maybe you're ready to unload something? Whatever you need!" M'raaj-Dar also has some very interesting ways to say goodbye after you exit conversation with him. Before he starts to trust you, he will dismiss you by saying: "Foul-smelling ape..." if you are not playing as a Khajiit, or: "Away from me, housecat! Look at that fur. What a disgrace..." if you are playing as a Khajiit. However, once he trusts you enough and becomes friendly, he will instead say: "Until we meet again, my dear friend!" Several of the items that he sells are unique and not available anywhere else so it is advisable to buy them before The Purification quest is completed, although the spells he sells will also be available from one of the new recruits in the Sanctuary after completing the Honor Thy Mother quest. However, these spells will be cheaper when bought from the new recruits. All magicka costs are reduced from M'raaj-Dar's original prices. It is not possible to invest in M'raaj-Dar, even after you have reached 75 skill in Mercantile. M'raaj-Dar is one of only three service providers in the game who cannot be persuaded, limiting your options for how to increase his disposition towards you. However, keep in mind that he is only a Novice at Mercantile so his disposition does not need to be raised very much. This also means that on the Xbox 360 and PS3, it is more awkward than usual to access his barter menu. The down control does not work; you must instead use the left or right controls (either via the thumbstick or direction controls). M'raaj-Dar is one of the few Dark Brotherhood members with a responsibility above 30, presumably to stop him from acting as a fence. M'raaj-Dar's vendor chest contains his unique items as well as the standard ones, and is set to respawn. This means that several copies of his unique items can be obtained by waiting for the chest to reset. Esta página foi modificada pela última vez à(s) 23h50min de 12 de novembro de 2015.